The purpose of this paper is to promote the consistent use of appropriate, inclusive and non stigmatising language when talking or writing about dementia and people living with dementia. Read, download or listen to the full language guidelines PDF file here. Or read the summary below. The words used in speech and in writing can influence others’ mood, self-esteem, and feelings of happiness or depression. A casual misuse of words or the use of words with negative connotations when talking about dementia in everyday conversations can have a profound impact on the person with dementia as well as on their family and friends. It can also influence how others think about dementia and increase the likelihood of a person with dementia experiencing stigma or discrimination. Respectful language recognises that dementia is not the defining aspect in the life of someone with a diagnosis and does not reflect their capacity or level of understanding. It is important to respect others preferences about words used about them, regardless of whether the person being talked about is present or not. Be mindful of not reinforcing stereotypes or myths about dementia. 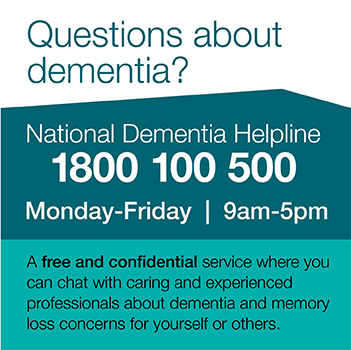 It is important to know the facts about dementia. For example, dementia is not a normal part of ageing, nor is memory loss the only symptom. Dementia can affect language, planning, problem solving, behaviour, mood and sensory perception. Talking about dementia in a negative manner or by using incorrect terminology or inaccurate facts can reinforce stereotypes and further exacerbate the myths and misinformation about dementia. Everyone’s experience of living with dementia is unique, as there are many different types of dementia and symptoms may present differently in different people. Individuals and families will express their experiences of dementia in ways that has meaning and significance to them. Not everyone will wish to have their experiences with dementia described in the same way. Where possible, ask that person directly. We can respect the dignity of each individual by respecting that person’s wishes regarding use or non-use of certain terms relating to dementia. It is important to use language that focuses on the abilities (not deficits) of people living with dementia to help people stay positively and meaningfully engaged, and retain feelings of self-worth. Using the term dementia and related words in English may not always be appropriate when talking to people from culturally and linguistically diverse communities or in translation as it may be seen as offensive or disrespectful. Although the understanding of dementia is growing in the Anglo Australian community, there is still a lack of awareness of dementia in many diverse communities. In some cases dementia may be regarded as a mental illness or as as a normal part of ageing. Words and phrases that are appropriate in one community may be offensive or of no meaning in another community. It is important to be aware of the cultural background of the person, family or community so that you can use the most appropriate language. It is always advisable to seek guidance from culturally and linguistically diverse communities on appropriate terminology where possible.